« Previous : I am Sarah Michelle Gellar, also known as the girl who saves the world a lot. Ask me almost anything ! 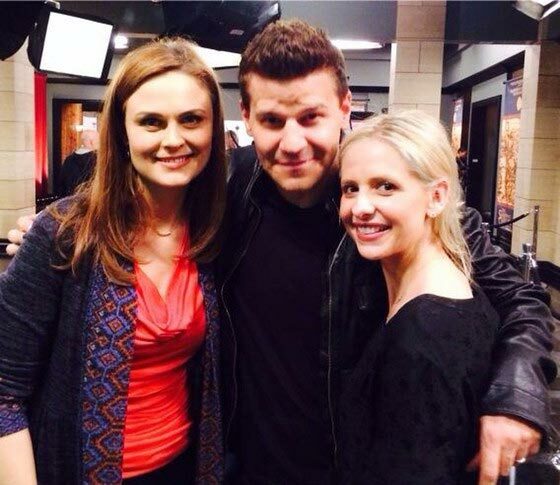 February 27, 2014 - Sarah Michelle Gellar visits David Boreanaz and Emily Deschanel on the "Bones" Tv Series set. There’s nothing like a little Buffy the Vampire Slayer nostalgia to cap off a long week. The titular tiny fighting machine and current star of The Crazy Ones paid a visit to her Angel, aka David Boreanaz, on the Bones set this week—and happily shared a photo of their reunion for their still-adoring fans. Oh yes, and there’s Emily Deschanel, too. "@David_Boreanaz @EmilyDeschanel- A tale of two leading ladies #Bones #BVTS," tweeted Gellar, who also firmly declared herself Team Angel (sweet dreams, Wheedonites) during a Reddit AMA session yesterday. Asked to name her favorite Buffy episodes during the Q&A, the 36-year-old actress named "The Prom," which closed the third season and sent Angel packing into that scary night (and into his own spinoff), as one of her all-time faves. "I just love that whole story, and I thought it just encapsulated the show so well," she wrote. "It was beautiful and heartbreaking." Gellar has been catching up with a lot of old pals recently, actually, her most recent brush with former costars coming when Seth Green and Michelle Trachtenberg paid a visit to The Crazy Ones set earlier this month. The new complicated man in her TV life now, however, is Robin Williams, who plays her kooky dad on their CBS sitcom. "He is the kindest, most incredible human being. You want to talk about a superhero ? He’s it," Gellar wrote about the Oscar winner on Reddit. But surely Boreanaz is welcome on the set any time.